I recently had the opportunity to revamp our deploy pipeline at GameChanger, my wonderful employer. The result is a system that is robust, doesn’t drop a single request during a deploy, and takes the same amount of time whether we’re running ten instances or a thousand. We achieved this using Serf, which provides a decentralized way to monitor cluster membership and trigger deploy events, and Lox, a simple Redis-backed service that helps us manage distributed locks across our cluster. Send HTTP requests to services running on all the servers! Do anything else that requires you to connect to ALL THE SERVERS! These are not great solutions. SSH is slow so it doesn’t scale very well. The second idea requires you to roll your own specialized deploy service. All three of these can easily be interrupted halfway through your deploy or fail on a subset of your servers due to network partitions, Time Warner internet, or a kaiju attack in northern Virginia. Here’s a somewhat simplified look at how Serf’s message propogation works and how we can send a message from one server and have that message eventually reach other servers that our originator doesn’t know about. With Serf in the picture, it’s now fast and easy for us to send a message to all of our servers. We simply SSH into a single box running in the cluster and send a Serf message from that box. Within seconds, every instance running in the cluster will start their deploy. We’ll use the cluster membership functionality too in just a bit. You may have caught a slight problem in that last paragraph: all the servers will start their deploy at the same time. This will probably take down your website. What we would really like is for our servers to take turns so that we never have a full service interruption. We also want the deploy to remain fast. If we only have 2 instances online, only 1 should deploy at a time. If we have 1000 instances, we can have 500 deploy at a time and deploy just as quickly as when we were only running 2 instances, giving us a consistent deploy time. We built Lox to help us do this. Lox gives us a way to manage a distributed deploy lock across multiple servers. Lox gives our servers a way to take turns during a deploy, and it also uses client-driven concurrent lock constraints to allow each group of servers to determine the speed at which they deploy. These constraints can also change in the middle of a deploy, so deploy stays fast even if you scale up in the middle of one. Let’s break this down. For more detailed information, you can refer to Lox’s documentation. key is a shared identifier common to all instances of a given type. We want all the production web boxes to use the same distributed lock. ttlSeconds lets Lox know to release our lock after 60 seconds have passed. This is important to prevent deadlocks if an instance dies while it has a lock. Notice how the client has to specify maximumLocks with each lock acquisition request it makes. 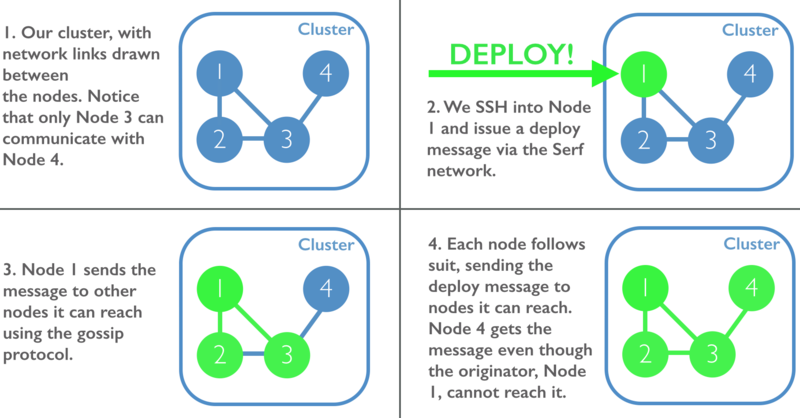 This allows the speed of the deploy to change dynamically with the size of our cluster. Lox compares the number of currently held locks on key with the maximumLocks that’s passed with the request. In our example, we passed maximumLocks=1, so Lox will refuse to grant a lock to this request if 1 or more locks are already held on the deploy.web.production key. How do we come up with the right maximumLocks number so that our deploy is fast but we never deploy all our servers at the same time? Each server recalculates maximumLocks every time it tries to acquire a deploy lock. This is where Serf’s cluster membership info is useful. When a server gets a message to deploy, we also pass it a concurrency variable letting it know what percentage of its sibling servers should be allowed to deploy at a time. In our example, our web servers each know using Serf that there are 2 total web servers. If we pass a concurrency variable of 0.5, they’ll both pass maximumLocks=1 in their lock requests. If more web servers join the cluster, their presence will be recorded in Serf and each web server will adjust its maximumLocks accordingly the next time it tries to acquire the lock. Using Lox and the cluster membership information provided from Serf, our servers can all take turns deploying with other servers of their same type. This works even though we triggered the deploy on all our boxes simultaneously through a Serf event. If you have questions, you can reach me on Twitter or in the Lox bug tracker if you have a question specific to Lox. Pull requests welcome!